“backwater shithole”, LOL. Great tag. I saw a documentary on Fresno once, dear God it’s like the zombies have taken over there. Be safe! Ha! I didn’t catch that. That picture you provided of Fresno makes North Dakota look like Paris. I can only imagine the twittering of anticipation in the local law enforcement offices. Why,this is the biggest thing since Jebediahs still leaked into the local water supply! You lucky sonuvabitch. A trip to Fresno is on my bucket list. If North Dakota isn’t Paris that means the corn silo I visited wasn’t actually the Eiffel Tower. * rolling on the floor, laughing * * wipes tears from eyes* I’m from california, I know all about Fresno. Poor Fresno. But-but, actually, what’s wrong with it. It looks like Anywhere, USA. You should go to Stockton, too and compare. 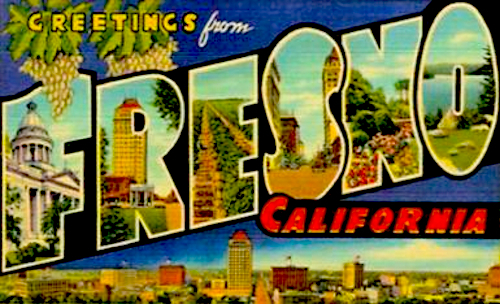 Hey, Fresno is the birthplace of Tom Seaver, so it can’t be all bad. I mean, I’m from Bridgeport, so I’m not exactly in a position to cast aspersions on anyone else’s hometown. Thank you for saving me that plane ticket. My envy is insurmountable. I’ve been to Scarborough, near Toronto, which sounds the same. Except there’s no sports or postcards. So that photo of Fresno must be fake. Because everyone in California owns at least one car and there are none to be seen in that photo. That’s really North Dakota, right? At least you aren’t going to Detroit, Chicago, Cleveland or East St. Louis, which are the most dismal and fetid holes in North America, in that order. I’ve been to them all, though Detroit was the only place I both feared for my life and for the integrity of the suspension of the car I was trying to drive over their decrepit (union maintained no doubt) and abysmal freeways. Enjoy your trip to somewhere that looks pretty fun. I get to go to Cincinnati Thursday- it’s a safe trip to a nice neighborhood for what it’s worth. Cinci’s actually one of my favorite cities if only for the history and architecture, though I am sure Jerry and Steve-o will somehow convince me to go over the border (my sister only lives 20 miles from Covington KY) to score them some $30 a carton smokes. Oh, joy and rapture, the I-75 Pilot Truck Stop in Covington! I never to need to visit Fresno. Ever!! Having just returned from glamorous Barstow, California, Mesquite, Nevada and Fillmore, Utah, I really appreciate your itinerary. So yes, I might be jealous.